SPINFUEL: Welcome Simply Vapour, to the pages of Spinfuel. We’ve been looking forward to talking to you. Would you like to introduce yourselves to our readers? Simply Vapour – Hello Spinfuel, we are Simply Vapour! A brief overview of our story and product descriptions are available at simplyvapour.com! Simply Vapour -Simply Vapour started making e-liquid in late 2010 when one of the owners; Kristine, wanted to vape but there were not many appealing flavors available on the market at the time. Her mother; Sue, having a background in science researched what was involved with making e-liquid and began experimenting with different flavor combinations. The feedback they received on their initial flavor creations sparked an interest in turning their experiment into a small business. Five years later Simply Vapour has become one of the largest manufacturers in Minnesota! SPINFUEL: How would you describe the Simply Vapour e-Liquid flavor signature? Simply Vapour –We have two product lines at Simply Vapour; Original Blend and Premium Blend. The Original Blend is a PG-based solution with a sweet and bold flavor profile. This is geared for beginner vapers or for people who are not interested in cloud production. The Premium Blend is max VG (80/20) with a smooth and subtle flavor profile. Premium Blend was created to produce plenty of clouds while still maintaining a great flavor. SPINFUEL: Where do you do your mixing, bottling, and shipping? Simply Vapour -We do all mixing, bottling, and shipping in-house. We also titrate each batch in-house to ensure proper nicotine strength. Our Premium Blend products are lab tested through a company called Enthalpy (results available on product page). Simply Vapour – Our target audience has been and always will be adults looking to quit smoking combustible tobacco cigarettes. Simply Vapour – Our products are rigorously tested using multiple hardware variations to ensure the best possible flavor regardless of device setup. Final verdicts are generally made using a Dotcom RDA with a Kanthal .3ohm dual Clapton coil running at 50 watts. SPINFUEL: Have you attended many vape expos or conventions? 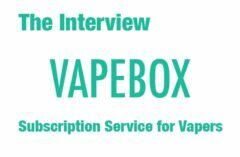 Simply Vapour –Will you have a booth in any future events that we could tell our readers about? W e have been very busy in Minnesota so it took us a little while to get to our first expo. Our first booth was in Winston-Salem at Vape Mania 15. Since then we have been to Vape Fest in Miami and VCC in Tulsa. Our next appearances will be at Vape Fest Las Vegas Feb 26 and 27 and Vaper Slam in Charlotte March 18, 19 and 20. Simply Vapour –This is such a tough question because preference and taste is so subjective. A good all-day-vape to us is determined by flavor preference and the overall vape experience. Typically, we prefer a defined flavor with a smooth inhale. Cream and subtle fruit flavors are a big hit around here. Simply Vapour – Simply Vapour remains optimistic the OMB will send the deeming regulations back to the FDA for reworking. However, if the regulations are passed as written, unfortunately, Simply Vapour will be unable to meet the financial burden of the premarket approval process (as will most other small eLiquid companies). We are, however, prepared to participate financially in the litigation that will most likely occur in opposition to the deeming regulations. In the mean time, Simply Vapour will continue to maintain a dialogue and promote ongoing discussions with critical legislators at the state and federal level as we navigate through the regulatory process. Simply Vapour – We are always working on new flavors! Our current product lines are already considerably larger than many other vendors so we do not anticipate expanding the numbers any time soon. We do replace older products with new ones from time to time to keep things fresh. There is also some discussion of taking our new flavor ideas and creating a boutique line. Simply Vapour –Yes. Be proactive to protect this industry. 2016 is going to be a big year for vapers and vape-related businesses. As we stated earlier we are optimistic for the future of vaping but work still needs to be done to continue the momentum being made. If your state has an advocacy group, ask how to get involved. If your state does not have an advocacy group look to see what other states are doing and create one. There area lot of resources available on the web on how to become active in advocacy. If you are not passionate about advocacy you can contribute in other ways such as making a donation or shopping from vendors that support advocacy efforts. It will be our numbers that make us strong and there are already many of us. Let’s continue to grow and protect the freedoms we have come to enjoy from this amazing product that has taken us away from combustible tobacco cigarettes. SPINFUEL: Thank you for sitting with us, and thank you for allowing us to review your eLiquids.